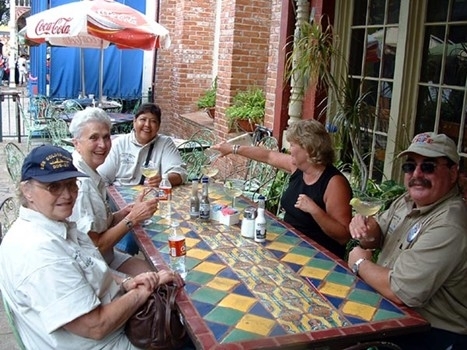 Forty-nine shipmates and guests attended the 2004 reunion in San Antonio, Texas. We were honored to have Retired Rear Admiral Paul L. Lautermilch and his wife, Dottie join us from their home in Virginia. Admiral Laudermilch was GOLDSBOROUGH’S fourth commanding officer (68-70). Shipmate Pat (Doc) Taylor (69-71) selected the Hyatt Regency on the famous San Antonio Riverwalk as the reunion hotel. The location gave attendees the opportunity to visit shops and fine restaurants on the Riverwalk during “free time”. Pat planned a tremendous four days of tours, welcome reception and three scrumptious meals. In addition to our banquet we enjoyed a Texas Bar B Q and a Mexican Buffet. Many thanks to Pat for a job well done. We enjoyed a riverboat cruise, visited the Aamo and other missions, a Mexican Market, and the Lyndon B. Johnson Ranch. The group also visited Fredericksburg, Texas where we had the opportunity to visit the National Museum of the Pacific War, which includes the George Bush Gallery of the Pacific War and the Plaza of the Presidents. We enjoyed a few hours of visiting the many shops in Fredericksburg. Based on the number of packages and shopping bags brought back on the bus, many of us had a successful day of shopping. Several of us visited Lackland Air Force Base where we observed security dog training and urban security procedures. The NAVY’s Master at Arms rating “A” School is co-located with the Air Force security training at Lackland. The well-stocked hospitality room once again was well attended and all attendees enjoyed the camaraderie with shipmates and guests. Many thanks to San Antonio area resident, Shipmate Steve Flanagan (69-73) for his assistance in keeping the room well stocked with beverages and snacks. Admiral Laudermilch’s remarks as our banquet speaker brought back many fond memories not only our time in GOLDSBOROUGH but also all our time at sea. As is our reunion tradition, the grand finale was the auction held after the banquet. Once again our auctioneer, Pat Taylor, did a great job entertaining us while auctioning the donated items. For the fifth straight year Earl Hall (plankowner) took away the big prize with his high bid. First time attendees this year included Steve and Carol Flanagan (69-73), Paul and Dottie Laudermilch (CO 68-70), Gerald and Virginia Lucio (77-78), Joe Picken (67-68), and Dale Slusser (71-72) and Plankowners Roy and Christine Satterstrom (63-64) and Peter Van Flagg (63-66). We are currently doing preliminary research for our 2005 reunion in Philadelphia, Pennsylvania. Evelyn and I made a pre-reunion site visit to Philadelphia last week. We visited hotels, many historical sites, and talked to tour operators. We returned home satisfied that Philadelphia will be a tremendous location for our sixth reunion. Details will be announced when finalized. We are looking at late July for our 2005 reunion. It is not to early for making plans to attend. We hear a lot about “band of brothers” these days; you will discover that no matter when you served in GOLDSBOROUGH we are a special group of shipmates with much in common. We hope to see many of our shipmates and guests in Philadelphia. If you live in the Philadelphia area and would like to assist with next year’s reunion, please contact me. Our seventh reunion will be held in either the Pacific or Mountain Time zone. If you have a recommendation for the reunion city, please contact me.